The flagship of iPhone - iPhone 6 finally enters into mass attention with the 4.7-inch model called iPhone 6 and the 5.5-inch model named iPhone 6 Plus. No matter when iPhone 6/Plus will come to your hand, it is absolutely good news for iPhone fans who would like to watch videos with mobile phone because of better visual effort with larger screen size. When talking about watching videos on iPhone 6 or iPhone 6 Plus, you need to make sure if the video is compatible with iPhone 6/Plus. For example, you cannot watch AVI video on iPhone 6 directly because iPhone 6 (Plus) just supports MP4 (MPEG4 or H264 codec) video format. So, if you have an AVI video and want to watch it on iPhone 6, you may need to convert AVI to iPhone compatible format. Here, I will show a great solution to convert AVI video to iPhone 6/Plus on Mac for watching smoothly with the best iPhone 6 video converter-MacX Video Converter Pro. MacX Video Converter Pro is powerful on converting AVI videos to MP4 on Mac to watch on iPhone 6/Plus and supports flawlessly converting standard videos, such as MOV, WMV, FLV, WebM, or other HD videos, such as AVCHD, MTS, MKV to iPhone 6 on Mac. And the specially designed "CPU Core Use" option and "Use High Quality Engine" enables to have a quicker conversion speed and better output image quality. 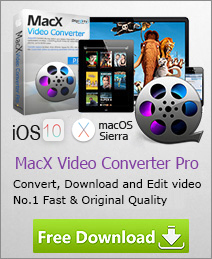 Please download MacX Video Converter Pro and launch it. Follow the steps to convert for watching AVI videos on iPhone 6 & iPhone 6 Plus. Step 1: Add AVI videos by clicking "Add Video" icon. Step 2: After video is loaded, the Output Profile dialog box pops up. Please select Apple Device and click "to iPhone Video" to get an appropriate format for iPhone 6. Step 3: Click Browse to set Destination Folder for saving converted video. Step 4: Hit the "RUN" button to start AVI to iPhone 6 conversion on Mac OS. Just a couple of minutes, the AVI video will be converted. Connect iPhone 6 with Mac and put the converted video to iPhone 6 from destination folder. Now, you can watch AVI on iPhone 6 without any compatibility problem. What's the video and audio formats that can be played on iPhone (iPhone 4, iPhone 3GS, iPhone 3G)? Here you will will learn more about the iPhone supported video formats and free Mac DVD ripper & free Mac video converter for transfer DVD movies and video files to iPhone on Mac OS. To download YouTube video for offline playback on iPhone 6 is now available to you. Simply download MacX Video Converter Pro and then you can fast convert YouTube video to iPhone 6 compatible format for unlimited playback with highest quality. 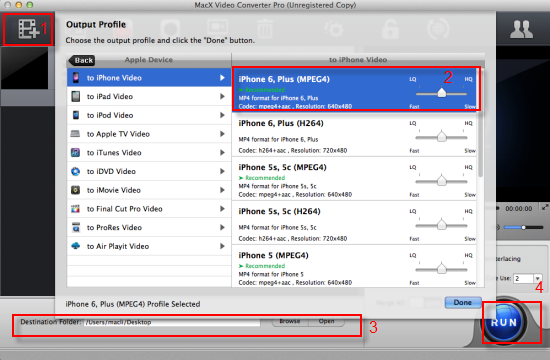 MacX Video Converter Pro is ultimate video converter software to convert AVI to iPhone, FLV to iPhone, MP4 to iPhone, etc. You can also download YouTube video and convert them as you need as well. Download this AVI to iPhone converter free.